Home :: GIFT TAGS :: Airmail Gift Tag Set: I bought you the best gift . . .
Airmail Gift Tag Set: I bought you the best gift . . .
Airmail Gift Tag Set: I bought you the best gift. . .
Adorn that pretty package with the perfect gift tag! 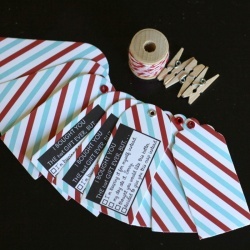 Set of 9 airmail gift tags (3 scallop, 3 round, 3 text). Text reads: "I bought you the best gift but. . .
__ my dog ate it. Sorry. __ thought you would like this better. __ decided to give you this crap instead"